South Africa’s First Plastic Road! 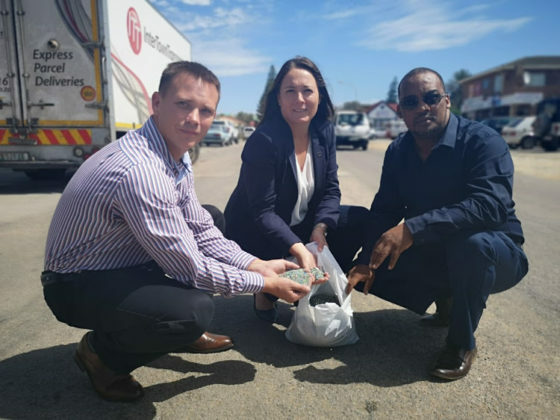 Kouga municipality in the Eastern Cape is set to build the first plastic road in SA. Left to right: Gareth Nel from MacRebur, Eastern Cape MPL Vicky Knoetze and Kouga mayor Horatio Hendricks on the road in Jeffreys Bay where construction is expected to start in April 2019. Kouga municipality mayor Horatio Hendricks said on Monday at a media launch in Jeffreys Bay that local civil engineering and construction companies SP Excel and Scribante Construction would partner with Scottish firm MacRebur to build a 1km stretch as a trial run in the coastal town. Vicky Knoetze first pitched the idea to the provincial legislature, which shot it down, in 2017. She said that up to 1.8 million plastic bags could be used to build a 1km stretch of road. “Non-recyclable plastic waste, which ends up in the ocean or clogging up landfill sites, is processed into pellets and used to replace a large component of the bitumen in a conventional asphalt mix,” said Knoetze. Work is expected to start in about a month. The trial is free for the municipality with the partners set to pay for it. This Article was first published on Times Live.